This is one of a few images that I took while playing around with an infrared filter that I bought during my trip to California last October. I only spent a brief amount of time reading about shooting with one of these filters before getting out and trying it, and as such, forgot about a few things, such as setting a custom white balance before starting shooting. Even though I didn’t follow through with all the steps that you should be doing, I am still happy with the results; editing just took a bit longer than it would have otherwise. I am excited for spring to arrive and have the chance to get the filter out and work with it some more. I don’t think infrared images of snowy fields and trees would have much impact! Some of the beautiful boulders in Joshua Tree National Park. California, October 2018. 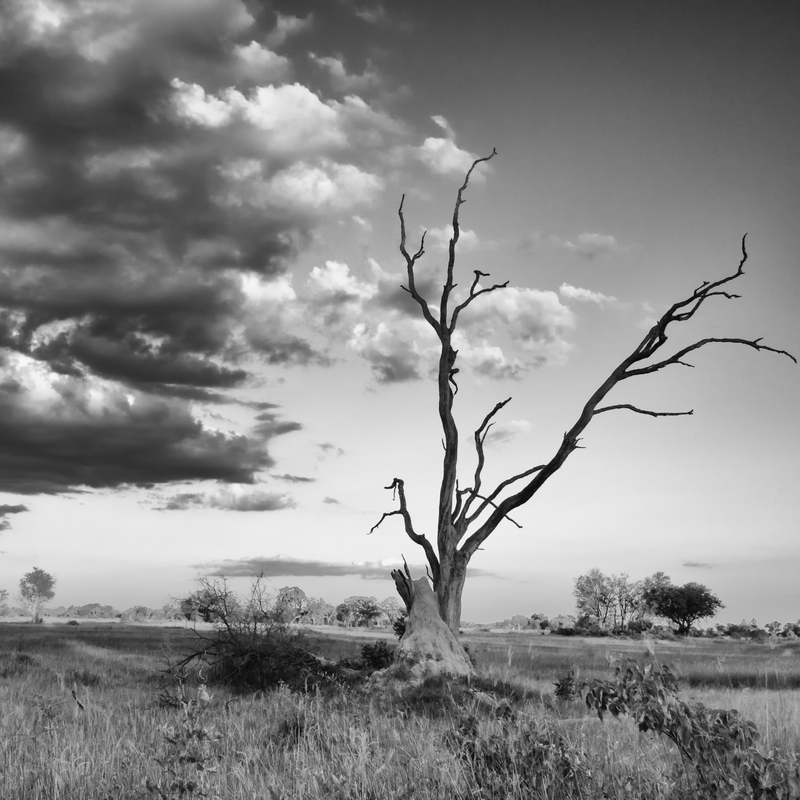 The amazing Okavango Delta, from the air, is the image I have selected for my monochrome Monday post this week. It is such an amazing and beautiful location, and one that absolutely needs to be experienced from the land, the air and the water to truly get an appreciation for the magic of the place. Definitely a destination I hope to return to again. When I woke up this morning, it was -28C; decidedly not warm here. But the sun is shining, and bundled up, Spencer and I managed a couple of nice walks today. It still doesn’t feel like spring is around the corner; but hopefully that will change soon. Last week, I flagged several landscape images from my travels for editing throughout the week, and while working on them, I realized that not only do they all fit into the theme of being taken in warm places, but they were all taken on the fly. If I asked guides to stop every time I saw something interesting, we certainly wouldn’t get very far, so I have become rather comfortable with snapping away out of a moving vehicle. Sometimes it works, and sometimes, not so much. I hope you enjoy my selection of images this week. The Hoanib riverbed off in the distance. The shear drop off is the bank of the river, showing just how much water has been through the area at times. When we were visiting, there were only a few small pools, and it had been an exceptionally generous wet season. Namibia, April 2017. As the day heats up, the wind in the desert picks up, causing sand storms to whip through. Hoanbia Camp, Namibia. April 017. One of the beautiful desert vistas near Hoanib Camp. Palm trees are a symbol of a warm climate to me. I love the shape of the leaves, and how they stand out against the sky. This was just before sunset while heading back to Leroo La Tau camp on the Boteti Rover. Botswana, May 2017. The Baines Baobabs standing tall in the midday heat. Nxai Pans National park, Botswana. A beautiful sunrise in the Sabi Sands. The chill of the early morning burnt off in short order once the sun was up. South Africa, May 2017.